After the deluge of Thursday morning I considered buying that book "Ark building for dummies", just in case. But then I remembered - it's just the way the weather is in Phuket. You get heavy rain sometimes but it rarely lasts for long. Thursday afternoon was dry, but there was a change in the weather as the westerly winds picked up making seas choppy for the last few days, but blowing away the clouds and making the air fresher and less humid. There has been barely a spot of rain since Thursday afternoon. Today I was not working, and was rather sure it would rain. Dark clouds hovered over the hills last night. Dark clouds have lurked all day, but there has also been sunshine. We went for an early lunch at Kan Eang 2 Seafood. In fact, so early that we were the first customers. It's a simple restaurant by the water at Chalong Bay. After lunch, a quick drive to Phromthep Cape. We used to pass by this area a lot, but somehow in 3 ½ years my son has never been up the lighthouse at Phromthep. 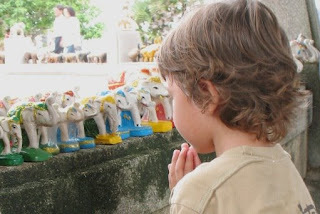 He was also impressed by the shrine which is surrounded by elephants and dashed off for a quick prayer! The coast around the southwest corner of Phuket is rocky and quite dramatic with steep cliffs, little beaches and rocky islands. 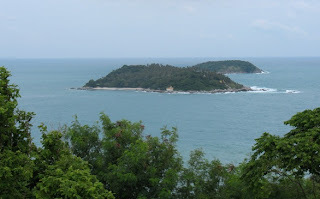 The island below is Koh Kaew Yai, just south of Phromthep Cape. 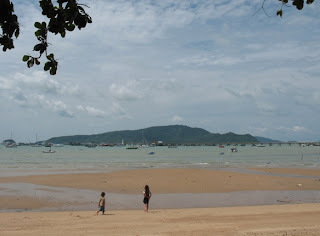 There's a shrine on the island and we do intend to hire a longtail (from Rawai beach) to go over there one day!